BEIJING: When Li Shufu, chairman of Zhejiang Geely Group Holding Co Ltd, celebrated the company's agreement taking over Swedish luxury brand Volvo on Tuesday, nobody could foresee the challenges and risks ahead for the Chinese automaker. Yes, the deal gives the Hangzhou-based company access to new technologies, control of the Volvo brand name and, perhaps, a shortcut for Geely into the global automobile industry. But conversely, the huge purchase could also be the privately owned automaker's fast track to financial ruin. And while Geely proved it could muster enough capital to conclude the transaction, whether it has the financial muscle to take over and develop Volvo over the long haul remains to be seen. Addressing the money issue, Yin Daqing, Geely's chief finance officer, said in Beijing on Tuesday that Geely has obtained "enough" financing to foot Ford's $1.8 billion bill and still have $0.9 billion left over for future operational costs. However, according to a Bloomberg report last week citing a Volvo board member, in reality the Chinese automaker will need at least $1.4 billion to revive the troubled Swedish brand, a sum that Geely may be hard pressed to come up with. Domestic auto analysts agree, forecasting Geely will need between $1.6 billion to $2 billion to keep the Swedish firm operational. Volvo reported losses of $1.69 billion (almost 10.5 billion yuan) in 2008. That compares with a 1 billion yuan profit for Geely in 2009. Last year Li admitted that the company had about 10 billion yuan in debt, a sum he later declined to explain in detail. News analysis: Will Volvo brand thrive? Based on those numbers, it appears near impossible for Geely to garner the financial support required to revive the Volvo brand. 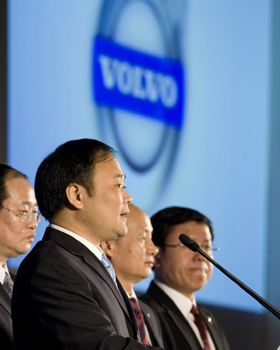 Moreover, "it will be very hard for Geely to allow Volvo to recover from its poor performance within two years because of the high operational costs associated with Volvo," said Frank Xu, head of mergers and acquisitions at China International Capital Corp Ltd.
Xu has helped several interested companies valuate Volvo since Ford first put the Swedish automaker on the market at the end of 2008. The dealmaker also cast serious doubt on Li's promise to move Volvo out of the red in two years, indicating Volvo's profitability may come to the detriment of Geely. In 1999, Ford spent $6.4 billion to acquire Volvo, and 10 years later will only receive $1.8 billion back. Even Ford, the century-old US auto giant, could not manage Volvo profitably.